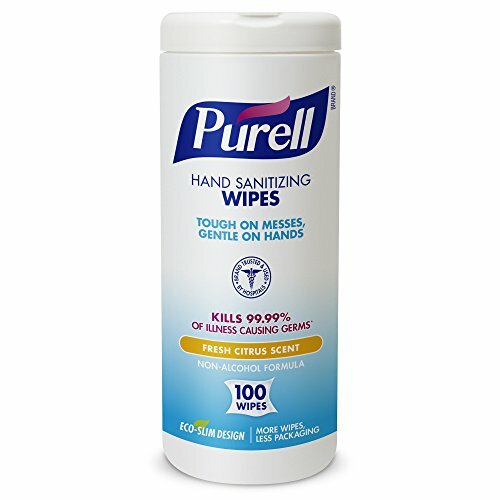 PURELL 9111-04-EC sanitizing wipes are antimicrobial premoistened hand wipes with 0.13 percent benzalkonium chloride to help reduce the number of germs on hands and remove light soils, and they come in a 100-count plastic canister that helps keep moisture in. A pop-up dispenser allows individual wipe extraction. These textured wipes are lint-free to leave hands clean. Each wipe measures 6 x 8 inches. They are listed by NSF International (formerly known as the National Sanitation Foundation) as a category code E3 hand-sanitizing product for use in USDA-regulated food processing environments. Hand sanitizers (also called hand antiseptics) are liquids, gels, or foams that help reduce the number of germs on hands when a small amount is rubbed into the skin; no rinsing with water or drying with towels is needed. Hand sanitizers can quickly reduce the number of germs on hands, but do not eliminate every kind of pathogenic microorganism. Hand sanitizers are not as effective when hands are visibly dirty. They are available in a range of sizes, from small bottles for personal use to large mounted dispensers for public or institutional use. They are also available as wipes: small, disposable paper or nonwoven towels soaked in a hand sanitizer liquid. Hand sanitizers are typically part of hand hygiene programs at health care and food processing facilities, where pathogenic microorganisms are common. GOJO Industries manufactures hygiene products, including hand washing, hand sanitizing, and skin care formulas under the GOJO, PURELL, PROVON, MICRELL, and AQUELL brands. The company, founded in 1946, is headquartered in Akron, OH.